My Wrap Site! - The Wrap! What is this crazy wrap thing? The Ultimate Body Applicator (That Crazy Wrap Thing) is a non-woven cloth wrap that is infused with a powerful, botanically-based formula to deliver maximum tightening, toning and firming results in as little as 45 minutes! It continuously hydrates for firmer, smoother, more youthful-looking skin, and reduces the appearance of cellulite and skin slackening. 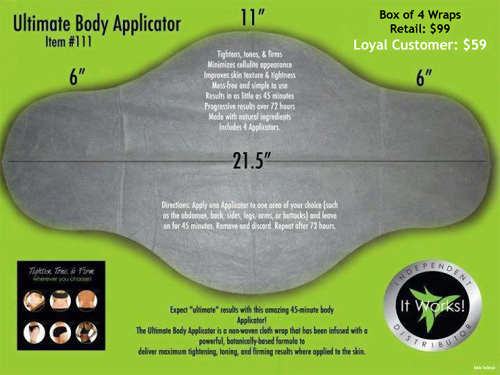 Each Ultimate Body Applicator is approximately 13" x 21" and comes in a versatile shape that can be applied wherever you choose to see results, such as the stomach, sides, back, upper arms, thighs, or lower legs. You Bet! But... Keep in mind they're NOT magic. The wraps were designed to TIGHTEN, TONE & FIRM along with reducing the appearance of cellulite. Most people WILL see results from these wraps within one hour. (That's what makes them PERFECT for home parties). Just take a look at the video below that shows how easy the wrap is to use! The Crazy Wrap Things are NOT meant to be a substitute for healthy eating habits or exercise... that would just be silly. They are meant to tighten, tone, and firm those annoying, fat-prone areas that just won't go away on their own. The Ultimate Body Applicator delivers the results that we are all looking for. You choose the area on your body that is a problem for you, simply apply the Ultimate Body Applicator, and relax for 45 minutes. It's really just that easy! You'll see real, measurable results that last. After all, the tape measure doesn't lie!